Steel rolling consists of passing the material, usually termed as rolling stock, between two rolls driven at the same peripheral speed in opposite directions (i.e. one clockwise and the second anti-clockwise) and so spaced that the distance between them is somewhat less than the thickness of the section entering them. In these conditions, the rolls grip the material and deliver it reduced in thickness, increased in length and probably somewhat increased in width. This is one of the most widely used processes among all the metal working processes, because of its higher productivity and lower operating cost. Rolling is able to produce a product which is having constant cross section throughout its length. Many shapes and sections are possible to roll by the steel rolling process. Steel sections are generally rolled in several passes, whose number is determined by the ratio of initial input material and final cross section of finished product. The cross section area is reduced in each pass and form and the size of the stock gradually approach to the desired profile. Rolling accounts for about 90 % of all materials produced by metal working process. It was first developed in the late 1500s. Hot Rolling is carried out at elevated temperature above the re-crystallization temperature. During this phase, the coarse-grained, brittle, and porous structure of the continuously cast steel is broken down into a wrought structure having finer grain size and improved properties. Major parameters in the three stages of mill processing are as follows. Reheating – The input material usually billet is heated in the reheating furnace to the rolling temperature. The important parameters are heating rate, time of heating, and temperature of reheating. Rolling – The important parameters for rolling in the roughing, intermediate, and finishing group of stands in the rolling mill are temperature, percentage of reduction in area, inter-pass time and strain rate. Cooling – The major parameters after finish rolling during cooling of the rolled product are start temperature, cooling rate and the final temperature. When manufacturing long products, it is common to use a series of rolling stands in tandem to obtain high production rates. The stands are grouped into roughing, intermediate and finishing stages. Typical temperature, speed, inter-stand time (time between each stand), true strain and strain rate ranges at each stage are shown in Tab 1. Since cross-sectional area is reduced progressively at each set of rolls, the stock moves at different speeds at each stage of the rolling mill. A wire rod rolling mill, for example, gradually reduces the cross-sectional area of a starting billet (e.g., 150 mm square, 10-12 meters long) down to a finished rod (as small as 5.0 mm in diameter, 1.93 km long) at high finishing speeds (up to 120 m/sec). With regards to the steel material steel, the development of the microstructure during rolling is complex and involves static and dynamic re-crystallization of austenite. From a practical point of view, the austenite grain size distribution in the rolled product is of paramount importance in controlling mechanical properties. In the roughing and intermediate stages of the rolling mill, the stock is moving slowly between the stands, such that the material has a chance to ‘normalize’ itself as a result of recovery and re-crystallization. During the finishing rolling stage, the stock is traveling at a high speed between closely spaced stands and consequently, and does not have adequate time to normalize. This lack of normalization can have a significant effect on the final microstructure and mechanical properties of the rolled product. Since the chemical composition is fixed for specific steel grades, the requirements for a particular product that can be controlled in the rolling mill consist of geometry, mechanical properties and microstructure. The product characteristics which are controlled are the geometric shape and tolerance. These are determined from the section profile of the finished product. Mechanical properties include yield and ultimate tensile strengths, % reduction in area (ductility) and hardness. Microstructure characteristics include grain size, grain distribution, phase composition and phase distribution. Rolling involves macroscopic and microscopic phenomena (Fig 1). The macroscopic phenomena can be broadly classified as (i) heat flow during rolling, and (ii) deformation under application of rolling load. The macroscopic phenomena include such factors as given below. Thermal expansion and contraction during the heating and cooling cycles. The process at the microscopic level involves many complex physical phenomena associated with nucleation and evolution of the microstructure. 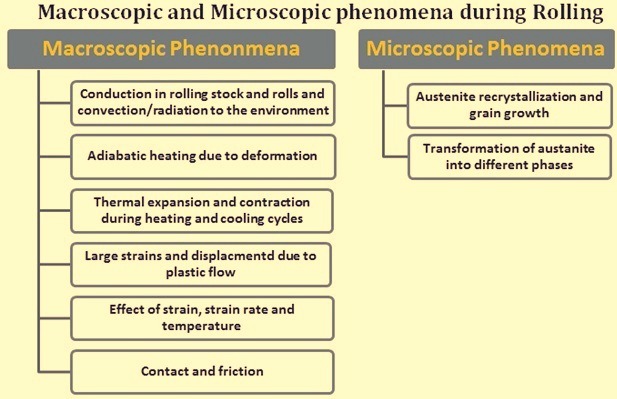 The principal microscopic phenomena that are important during the process of rolling are (i) austenite re-crystallization and grain growth, and (ii) transformation of austenite into ferrite, pearlite, bainite and martensite (and/or other phases). The spread and side free surfaces are very important in rolling. Spread is defined as the dimension of the deformed stock after rolling in the direction perpendicular to the direction of rolling. It measures the increase of width of the stock due to the rolling deformation. The side free surface is defined as the region of the stock surface that does not come into contact with the rolls during the rolling process. The surface profile of a deformed stock depends on the spread, free surface profile, and the elongation of the stock. This means that the final shape of the stock is mainly dependent on these parameters. Since the final shape of the stock is very important for the rolled product, these parameters are very crucial to a roll pass designer when designing a particular rolling pass for specific shape and size requirements. Accuracy in calculating these parameters are critical when satisfying such geometric requirements as roundness (in case of bars and rods) and tolerance. Roundness is defined as the difference between maximum diameter and minimum diameter. Tolerance is the allowable difference in maximum / minimum dimensions with respect to nominal dimensions. The mean effective plastic strain is extremely important for predicting and controlling the mechanical properties of the rolled product after rolling The mean effective plastic strain at a rolling stand is defined as the maximum average effective (equivalent) plastic strain of the rolling stock at a given mill stand during the rolling process. The microstructure evolution requires thermo-mechanical variables such as mean effective plastic strain, mean effective plastic strain rate and temperature at each rolling stands. Temperature evolution due the mechanical energy converted to heat during the deformation process is also dependent on mean effective plastic strain and mean effective plastic strain rate. Furthermore, mean effective plastic strain rate is in turn a function of mean effective strain and the process time. All of this suggests that the capability of predicting mean plastic strain is essential for controlling the mechanical properties and microstructure of the rolled product. Calculation of roll force is important because calculation of torque and power in a rolling mill is based on calculation of roll force. Accurate prediction of roll force for grooved rolling is considerably more difficult than predicting the geometry of the rolling stock. There are essentially three problems, present during the rolling as well but somewhat easy to handle. They are (i) resistance of material to deformation, as a function of strain, strain rate and temperature, (ii) the ability to calculate the distributions of the strains, strain rates, stress and temperature in the deformation zone, and (iii) the conditions at the roll metal interface, i.e., the coefficients of friction and heat transfers. One more important parameter of high-speed high temperature rolling is the flow-stress behaviour of the particular steel grade. Flow stress is defined, as the instantaneous yield stress or true stress of a steel defined when the steel starts to undergo continuous plastic deformation. The two principal methods for accurately obtaining the flow stress of a particular grade of steel are direct experimental results and empirical constitutive equations. Empirical constitutive equations are often derived from the regression analysis of experimental data. Typically these equations define the flow strength of a material as a function of the variable considered important. The material of the roll is important since it must be capable of withstanding loads which plastically deforms the rolling stock without itself being plastically deformed. In the rolling of hot steel, this is not a difficult problem and iron or steel rolls are suitable if they are operated at a temperature considerably lower than that of the rolling stock. The choice of roll material whether cast iron or steel (cast or forged) depends on the specific duty the rolls are to perform and the important properties such as surface toughness, resistance to thermal cracking or shock loading or hard wearing properties. The selection of any particular roll depends on production demands, initial cost, and the specific qualities required. Tungsten carbide rolls are generally used in wire rod finishing blocks and in some shape rolling applications. These carbide rolls require high quality cooling water in a narrow pH range and limited hardness. During the hot rolling of steel, heat is transferred to the rolls. If not cooled, the heat buildup causes increase in the temperature of the roll to a temperature equal to that of the stock being rolled. At this stage the roll would also undergo plastic deformation. To remove the heat from the roll, cooling water is applied. The difficulty in the removal of the heat from the roll is the result of two factors. The first is called the coefficient of thermal conductivity and the second is the interface between the roll and the rolling stock compared to that of the cooling water and the roll. Heat is transferred by conduction, convection, and radiation. During the contact time of the rolling stock in the pass, the hot rolling stock heats the roll due to conduction during the contact time with the roll. As a result, the temperature profile on the surface of the roll increases when in contact with the roll and then drops as the heat is absorbed by the roll body. This also means that the best place to remove the heat from the roll is immediately after the bar leaves contact with the roll. The best rate of heat removal occurs when the difference in temperature is the greatest. A typical roll cooling water delivery system consists of holes in the delivery guide for the application of water as close to the point where the rolling stock leaves contact with the roll as possible. Two half circle water pipes for each roll also deliver secondary cooling water to assure the heat of rolling does not penetrate the roll body. The application of cooling water is to be controlled so that the water does not fall on the rolling stock at the entry point to the rolls. In case it happens, it only cool the rolling stock, create steam pockets between the roll and the rolling stock, and waste water that could be better used on the other side of the roll. To minimize roll wear, roll cooling water must be applied as close to the point where the rolling stock leaves the roll. Typical pressures of cooling water are 2 kg/sq cm to 5 kg/sq cm at a flow rate of about 1.5 litres / mm per minute. The best delivery systems use tube, nozzle and spray headers to get ‘soft cooling’ at low pressure and high flow, not a hard jet that ‘bounces’ the water off of the roll. Roll surface degradation occurs primarily due to the thermal cycling of the heating and cooling of the surface versus the relatively steady state of the subsurface and adjacent material. This creates local tension and compression as the roll moves through 360 deg of rotation. The objective of roll cooling is to minimize this cycle. The objective of roll material selection is to use materials that can tolerate this cycle without fire-cracking, crazing, or wearing prematurely. The fire-cracks developed on the roll surface are required to be removed by turning down considerable material of the roll and in the process reducing the roll diameter. This affects the roll life and increases the roll cost per ton. It is a fact that all mill rolls eventually deteriorate and the roll passes need to be changed to achieve size control and finished product surface quality. When the roll diameter reduces to less than the minimum diameter required by the mill stand after turning down, then the roll is to be discarded. The goal of mill and the roll guide setup is to get the first bar rolled when changing product, on the cooling bed within the tolerance so that it is a saleable product. The data required to perform this function is usually provided in two forms. One is given by the mill builders and provides information about rolls, guide parts, and other equipment that needs to be changed from the previous setup. It also includes gap settings, guide adjustments, and any special instructions. Mill floor and pulpit setup sheets also contain loop height settings, motor rpm (revolutions per minute), run-out speed, production rate, R-Factors, shear setup information and other pertinent information. To enable the fastest startup possible, the retained information should reflect the conditions at startup. That is, if the rolls are always dressed at change over, the R-Factors should be what they were the last successful rolling on new rolls. Data collected at the end of a rolling with used rolls will not be accurate when rolling on new rolls. In a continuous mill, speed matching the stand to achieve a constant mass flow through the mill assures a low cobble rate and fewer defects. High tension can stretch reduce the cross section of the bar making shape control very difficult. At the extreme, tension can pull the bar apart, creating a cobble. Compression of the bar between stands can create flutter creating defects, or at the extreme will cause loop growth leading to a cobble. Using the working diameter of the rolls, the roll rpm (revolutions per minute) is matched to the bar speed through the mill. As the rolls wear and the spread of the bar in the pass changes, the rpm of the stands need to be adjusted as the bar area changes. Most modern control systems modify the R-Factor as this occurs. The bar speed at each stand is calculated using the production tonnage rate for the product as a mill constant. Input values for setting mill motor speeds are production rate, roll collar diameters and roll gaps, bar areas and widths, and gear ratios. Motor speed ratings are normally checked against calculated speeds. Mill utilization is a measure of the percentage of time that the mill is rolling steel. The truest measure of performance is as a percentage of calendar time. Factors that influence utilization are maintenance outages, scheduled and unscheduled holiday outages, downtime for cobble clearing, roll and pass changes, excess billet gap, and other factors that create time when a billet is not in the mill. Good figures for rod and bar mills are 90 % to 93 %, for structural mills, the good mill utilization figures are 75 % to 78 %. If a mill rolls 80 % of the calendar year, that is 365 x 24 x 0.80 = 7008 hours. If the mill rolls 800,000 tons per year, it runs at an average production rate of 114.16 tons/hour. If the utilization can be improved by 1 %, the available rolling hours is 365 x 24 x 0.81 = 7096.6, creating 87.6 extra rolling hours. At 114.16 tons/hour that is an additional 10,000 tons can be rolled. Excess billet gap can be an unaccounted for loss of rolling time. If a mill rolls 800,000 tons per year using billets of 1.25 ton weight, it rolls 640,000 billets per year. That is 639,999 billet gaps. If the average billet gap is 5 seconds that is (5 sec x 639,999)/3600 sec/hour = 888.89 hours of billet gap. If the average billet gap is reduced by 0.5 second that would be (4.5 sec x 639,999)/3600 sec/hour = 800 hours of billet gap, creating an additional 88.89 hours of rolling time. At 114.16 tons/hour that is an additional 10147 tons of rolled steel. Yield is the measurement of production loss from furnace charge to bundled, piled, or coiled finished product. The factors that influence yield are scale loss, crop loss, cobble loss, and any other factor that reduces the weight of the finished product. When the billet is charged into the reheat furnace, it is either weighed or assumed to have a nominal weight based on its cross section and grade. As it progresses through the furnace, scale is formed that is removed at the descaler or fall off during rolling. This can amount to around 1 % to 1.2 % of the charged weight. Shears that crop the malformed front end of the bar as it progresses through the mill can remove up to 0.3 m to 0.4 m of material at each shear. After dividing the bar onto the cooling bed, a cold shear or saw cuts the bar to saleable lengths, cleaning up the variations in length. Structural mills often take an additional saw cut on piled and bundled material. All the removed material contributes to yield loss. Good figures for yield are around 97 % to 98 % for bar and rod mills, and 92 % t0 94 % for structural mills. If the product is rolled with negative tolerance and sold on nominal weight basis then the yield becomes much higher. Because of this reasons some of the rebars mills which are rolling with negative tolerance, and selling rebars on nominal weight basis are reporting a finished product yield of 100 % or more, though their nominal mill yield is normal 97 %. Cobble rate is the measure of the percentage of charged billets lost to cobbles. If the cobble rate is 0.75 %, then 0.75 % of all billets charged are lost to cobbles. If a mill rolls 640,000 billets per year then it means that 4800 billets are lost. At 1.25 tons per billet the loss in tons is 6000 tons. Hence it necessary that all attempts are to be made in the mill to reduce the cobble rate.